An earlier slightly different version of this post appeared on the old site in November, 2015. Once a year Mennonites in many parts of North America get together for what is known as an MCC Relief Sale. No relief is sold there. Instead, various Mennonites donate quilts, household items and food, which are then sold to other Mennonites with the profits going to various “good causes” conducted by the Mennonite Central Committee (MCC) in other parts of the world. A non-ethnic Mennonite friend of mine considers the whole affair an exercise in conspicuous consumption wrapped in a blanket of neocolonialism. Fair enough, but I usually go for the doughnuts. I’ve been attending the MCC Relief Sale in New Hamburg, Ontario since I was an itty bitty baby so I have eaten my way into plenty of neocolonial projects. I like to think that at least some of them have done less harm than good. I do have a certain amount of ambivalence over some of MCC’s policies and practices but I still support them because, as far as I can make out, it is an organization made up of mostly good people trying to do good, and that is more than can be said for many an organization. It also has the rare distinction of being an institution that has managed over a remarkably long period to bring together the different groups of Mennonites who otherwise have nothing to do with each other. Which is a feat in itself. And anyway, a life lived without ambivalence is hardly worth living. The Relief Sale has been called “one of the most important religious holidays for Mennonites” and it’s been given its scholarly due. To say it’s the most important implies that the Relief Sale is but one of many fun Mennonite festivals. No. The Relief Sale is pretty much all we’ve got. Compared to the great festivals around the world, the Relief Sale is pretty tame — we get together, eat and buy quilts. Not much of a bacchanalia. But, like I said, it’s all we’ve got. There is much to eat at an MCC Relief Sale but not many beverage options. In my family, an integral part of the tradition was a shared jug of apple cider (and by shared, yes, I mean we all swig it out of the same jug). Now, by apple cider I don’t mean the fizzy kind you can buy in a liquor store. I mean the so-called “sweet” kind that is made from B-Grade and other apples that were scrounged, bruised and rotting from the orchard floor, pressed into a brown liquid, and sealed in a jug. Yum. Apple cider isn’t a uniquely Mennonite tradition, of course. Lots of other people like apple cider, especially in the fall. You can find it the refrigerator section of your local grocery store. You drink it cold when you’re at an MCC Relief Sale but if you mull it with cinnamon and nutmeg, add a nice swoosh of brandy and a dollop of whipped cream, you’ve got yourself a nice comforting autumn cocktail that is reminiscent both of days in the quilt tent at the sale and another childhood favorite of mine — the Dutch Apple Pie. Dutch Apple Pie isn’t really Dutch – at least the pie I remember was a Pennsylvania Dutch confection – an open crust apple pie mixed with cinnamon, cloves and nutmeg. Some people put sour cream in it. It’s not a part of my own ethnic heritage. The Mennonites who came through Pennsylvania and created this lovely pie had their own culinary influences that weren’t at all like those of my forebearers. But we’ll still eat their pie. Despite all the strife and divisions among the different brands of Mennonite, we tend to be pretty open-minded when it comes to enjoying each others’ food. Well, pie anyway. Don’t talk to me about souse. This recipe is a simplified version of various apple cocktails that are all over the internet. Sure, go ahead and use an apple brandy and add some fancy orange liqueur if you want but I’m from simple folk and am looking for a simple drink. Besides, Prussian Mennonites actually have a history as brandy makers so adding brandy to anything is already an homage to my heritage. Pour the apple cider into a small saucepan and heat until almost boiling. Add spices and cook a bit more. 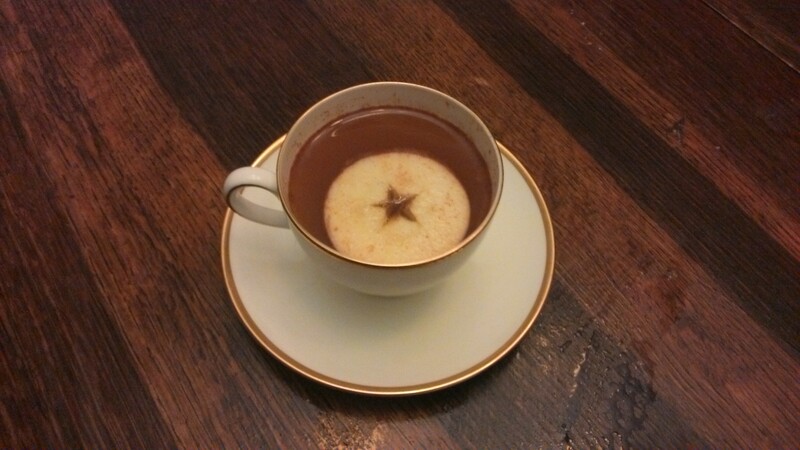 Pour brandy into cup and top with the hot cider. Garnish with a slice of apple and add a dollop of whipped cream. Sit by the fire and sip. Remember that time when we didn’t riot?